Garbage disposals are designed to fit a standard kitchen sink drain opening. Not every kitchen has a garbage disposal, and the decision to install one isn't a slam dunk. They deposit food waste directly into the plumbing pipes, and that can be unhealthy for a septic system. Moreover, they require maintenance, so landlords often shun them. However, if your home does have a garbage disposal, you probably enjoy the convenience of being able to flush food waste down your sink. Rest easy in the knowledge that your unit can easily last for 10 or 20 years if you take care of it. 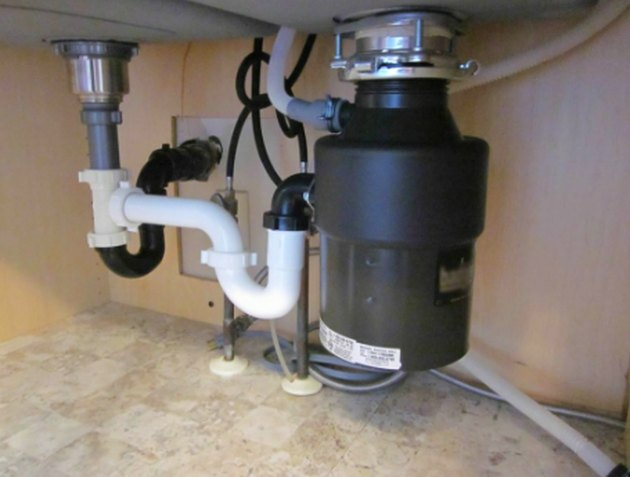 To properly maintain your garbage disposal, though, it helps to know how it works. Many people have misconceptions about this, and for this reason they don't take the steps needed to keep their unit in good working order. Without a proper understanding of the mechanism, you might be tempted to put things into the garbage disposal that you shouldn't. When you do this, you could end up with a broken unit or a massive sink clog. Both of these problems are easy to avoid with proper use and maintenance. The shredder ring works like a cheese grater. 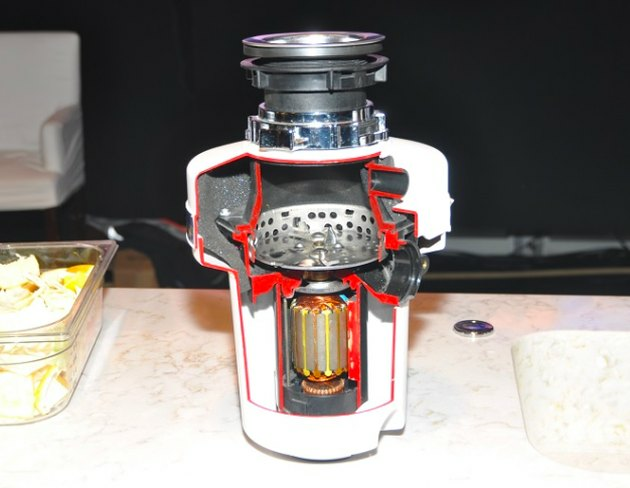 When you look inside a garbage disposal, you'll see what at first glance looks like the blades you find on a blender. But look a little more closely (not too closely!) and you'll see that they aren't sharp. They are actually impellers, not blades. Their job is to fling food waste toward the sides of the hopper where the actual shredding occurs, and the component that does this job is called, appropriately enough, the shredder ring. It looks just like a cheese grater bent into a circular shape. When you put food into the disposal, the impellers throw food against the shredder ring repeatedly and with such force that it gets mashed into small bits, just as cheese does when you run it over a grater. The faucet should always be running when you use the garbage disposal, because the flow of water is what washes the bits of food through the gap between the shredder ring and the rotor, which is the part of the unit that actually spins. When food isn't completely grated, or if it's too hard, starchy or fibrous to grate, it can get wedged in the gap. When that happens, the motor shuts down to prevent it from overheating. You can reset the motor, but first, you have to clear the clog. The majority of garbage disposals have a hex slot on the bottom. If you own a garbage disposal, it's probably just a matter of time before you experience a clog that shuts the machine down. Don't blame yourself. A variety of food items can get stuck in the gap between the rotor and the shredding ring, wedging the rotor so tightly that the motor goes into self-preservation mode and shuts down. The only way to prevent this from ever happening is to avoid using the garbage disposal altogether. Fortunately, if you own a name-brand machine, the manufacturer has your back. When the unit stops, first look on the underside of the unit. You'll find the red reset button that restores power, but before you press it, you need to free the rotor. Look a little more closely, and you'll see a 1/4-inch hex slot. You may still have the key that came with the unit and fits into this slot, but if you lost it—as most people do—you can buy another one at any home improvement enter or you can simply use a standard 1/4-inch hex wrench. Fit the wrench into the slot and move the rotor back and forth to coax material out of the gap. Turn on the water while you do this to flush anything that does come out down the drain. If you have to reach in to pull anything out, do it with salad tongs. Never reach your hand into a garbage disposal. When the rotor begins to spin freely, push the red reset button, then turn on the disposal and the motion of the rotor and the water will do the rest. Periodically grinding citrus fruit peels helps control odors. The first rule of garbage disposal maintenance is to watch what you put in it. Starchy foods, such as potatoes and rice, lodge in the shredder ring much like cheese lodges in a cheese grater. The shredder works less efficiently and clogs become more likely. Stringy foods like celery, artichokes and asparagus are virtually guaranteed to clog the rotor. Even if you avoid putting these foods in the garbage disposal, it's a good idea to grind ice at least once a month. Fill the hopper with ice, pour in half a cup of kosher salt and let the ice sit in the hopper for an hour before grinding it. The salt lowers the temperature of the ice, and the ice hardens the material in the shredder. When you grind the ice and salt, the hardened materials fall away and down the drain. A garbage disposal is a repository for odor-causing microorganisms. Keep these under control with a baking soda volcano. Pour half a cup of baking soda into the disposal followed by half a cup of vinegar. The mixture creates a cleansing foam that will bubble up and fill the bottom of the sink. Let it work for a few minutes, then turn on the faucet and flush it away. 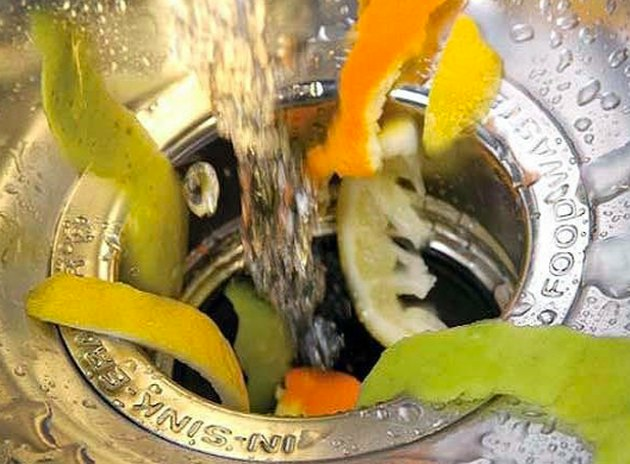 Other ways of keeping your garbage disposal clean are even easier. For example, periodically pouring boiling water into the disposal softens greases so they wash away. You can also simply pour in a mixture of hot water and dish soap and run the disposal while it washes odors and gunk down the drain.